If a member of your family was hurt or killed in a Jeep fire or explosion, you may need a Jeep Grand Cherokee fire lawsuit to claim the payments which are your legal right from negligent manufacturer Chrysler. Such Jeep lawsuits are needed due to dangerous defects in several Jeep vehicles, including the Jeep Liberty, the Jeep Cherokee and the Jeep Grand Cherokee. Despite clear evidence that defects in the design and manufacturer of these vehicles have caused catastrophic explosions and fires, especially when a Jeep is rear-ended, Chrysler delayed in making any Jeep recalls. Then, when it finally issued Jeep gas tank recalls in 2013, Chrysler did so only for selected Jeep Cherokee and Jeep Liberty SUVs, and did not issue a Jeep Grand Cherokee recall. Victims of exploding Jeep gas tanks have the legal right to seek financial recovery regardless of whether or not their Jeep has been part of a recall. But it certainly looks worse for Chrysler when a vehicle it did not even bother to recall causes such a horrifying gas tank explosion accident. As for what Jeep Grand Cherokee defects leading to a gas or fuel tank fire, they involve placing a plastic gas tank beneath the Jeep’s back bumper and behind the Jeep’s rear axle. Such a design is strangely comparable to the notorious design of 1970s Ford Pinto vehicles, which led to a massive recall following many deaths due to gas tank explosions, particularly in rear-end accidents. What makes the Jeep Grand Cherokee even more vulnerable is that it is a high-riding vehicle and, if struck from behind by a lower vehicle, the rear vehicle’s bumper could rupture the Jeep’s gas tank. An explosion and fire then could erupt via a single spark, which could be caused by electrical equipment in the vehicle or by the friction of the impact itself. Occupants of the Jeep Grand Cherokee then could be seriously burned if not killed. 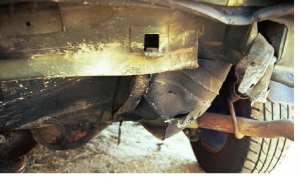 How many deaths have been due to Jeep gas tank fires? So far, at least 70 fatalities have been because of Jeep gas tank defects. No Jeep gas tank recalls have been issued yet by Chrysler for Jeep Grand Cherokee vehicles, despite urging by the National Highway Traffic Safety Administration to do so as early as 2010. Instead, Chrysler only recalled just over 1.5 million Jeep Cherokee and Jeep Liberty vehicles. It did not recall about one million Jeep Grand Cherokee SUVs, which the NHTSA had advised. Not only that, but Chrysler has been slow to repair such recalled Jeeps adequately. So far it’s only placed trailer hitches at the rear of a small number of recalled Jeeps, without even having run a safety study to see if that would prevent a gas tank explosion. At the rate Chrysler is going, it may take five years to make such a fix -- if that’s what it is -- for the recalled Jeeps. Meanwhile many thousands of defective Jeep SUVs, recalled or not, are roaming our roads. Of course, a trailer hitch isn’t necessarily the answer. Safety experts advise that a skid plate or shield of metal could protect Jeeps’ plastic gas tanks from rupturing in rear-end collisions. Independently of its meager Jeep recall actions, Chrysler quietly began shifting gas tanks in Jeeps to in front of the rear axle and, in fact, it did add the recommended metal skid plate as standard equipment. That process began in 2005 and could prevent a Jeep Cherokee fire or other Jeep fires for newer vehicles. Innocent American families who suffered injuries or deaths due to defective Jeep SUVs are fighting back. In fact, Jeep Grand Cherokee lawsuits have proven to be effective. A Georgia jury in April of 2015 gave a $150 million award to a family whose 4-year-old son was killed while riding in a 1999 Jeep Grand Cherokee. In this first of what should be many Jeep lawsuits, Chrysler finally was penalized and held accountable for its horrendous negligence. The Jeep Grand Cherokee in which the boy was riding was among those that the NHTSA had urged Chrysler to recall, and which the auto maker had refused to recall. The NHTSA believed all Jeep Grand Cherokee SUVs made between 1999 and 2004 should be recalled to protect consumers. Yet in 2013, Chrysler only recalled Jeep Cherokee vehicles made from 1993 to 2004 and Jeep Liberty vehicles made from 2002 to 2007. The Willis Law Firm can help Americans fight back by supplying a Jeep Grand Cherokee lawyer or attorney to handle their exploding Jeep gas tank lawsuit. These post-collision fuel-fed fires should not be happening, but Chrysler’s negligence had cost human lives and suffering, and Chrysler must be held accountable. Victims can claim financial compensation by engaging an experienced injury lawyer to stand up for them in the legal arena. Notify the Willis Law Firm today of your Jeep Grand Cherokee fire lawsuit needs, and let’s put you on a road to recovery by seeking payments for your medical and healthcare costs, your lost present and future wages and your family’s pain and suffering.